Storewide sale for MDC fans, get 15% off your entire order at Lord Vaper Pens. 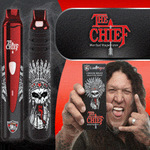 X Pen - The Chief - More! Go to Lord Vaper Pens and paste the code at checkout.